These actions relate to areas of shopping cart functionality, they will largely be coding changes made by our web development team. Product pages are an important part of any ecommerce website, arguably the most important – yet a lot of people upload manufacturer default descriptions and images and leave their product pages at that. For a number of reasons this is simply not acceptable any more – product pages often become organic landing pages, they should be as appealing and focused on making the sale as any PPC landing page. The flipside of this point is that product pages should be organic landing pages, the search engines can, and should, love your product pages for providing rich useful information about products – reviews, tags, high-level product summaries and detailed descriptions. There are several key changes we want to make in this area. The first is bringing in more product content (from reviews, manufacturer specifications and buying guides) – using the tab-style div layout we can add more information to the pages without overloading the customer with too much text the Apple product pages are a great example. We also want to upgrade our product photo viewer, the trend seems to be for a magnifying rollover effect that allows the customers to view smaller areas of the product in higher detail. Lastly I want to add a sort of reverse drill-down. I saw it in use on one store whose domain I’ve now forgotten. the idea is simple, if you’re on a product page for a Apple Macbook then there should be links like “See other laptops” and “See other apple products” so that your users are never left at the bottom of a ‘rabbit hole’. A special mention in this area – default the quantity to 1 for adding to cart – a stupidly simple but effective usability improvement for customers. We are fortunate enough to use several very high quality warehouses for our fulfillment operations, they are reliable and fast – two features we should be making a song and dance about to our customers! The best way to do this is with reinforcing message both on the product page and during checkout, about when the order will ship, the likely delivery time frames and ultimately the expected arrival date. We have access to webservice API’s which will allow this information to be gathered, and can present it to our customers. Care needs to be taken to always overstate our expected time frames, so as not to mislead customers. The cart page also gives multiple shipping options, each with an estimated elivery date. The second change in the fulfillment area is to be more thorough in our customer communication. Currently we automatically message customers as soon as we have tracking details from our carriers, but we should be messaging them sooner than that with expected shipping times, and then when the products are shipped expected delivery dates. It’s a nervous time between buying a product and receiving some confirmation that it is actually coming, we want to make the customer feel at ease and informed about their purchase. 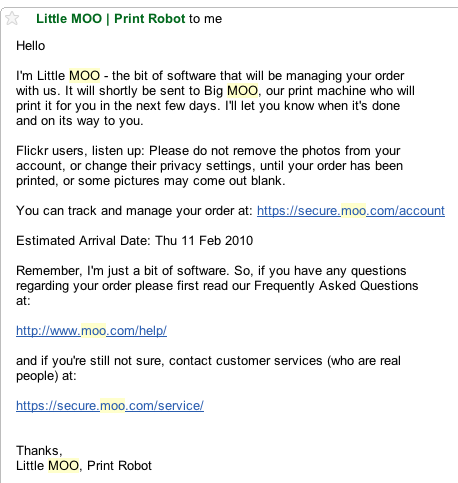 Here’s an example email that I got recently from Moo which I just loved – clear, plain text and it gives the all important estimated arrival I want as a customer anxiously awaiting correspondence. Moo Cards offer a great set of follow up emails - you should buy some business cards from them just to experience it! There was much talk at IRWD about making the checkout process better. I don’t know about you but I actually hate going through the address->credit card details->checkout pipeline everywhere I shop and I think all the discussion around checkout assumed it should be there. Customers already have their details stored with Paypal, Google Checkout or Amazon, why not let them checkout using those details? Banks are increasingly making PCI compliance more important, and onerous, to meet. If the cost of compliance approaches the percentage saving offered in credit card processing through a merchant account, then what benefit does a self-hosted checkout actually offer? To that end, we’ll be introducing Paypal Express Checkout and hopefully Amazon Payments into our stores over the next few months to complement Google Checkout. This will give customers a choice, but also save them doing an actual hosted checkout. The ‘I can’t be bothered waiting I’ll go somewhere else’ threshold is 2 seconds, speedy page loads are a very real contributor to conversion rates and we need to ensure that all of our pages meet this target (yes, that means you /search). I won’t go into technical details here, but performance increases for us can be achieved through PHP caching, increasing our EC2 virtual core count and larger memory, more efficiently used. This will largely be a engineering project, the results of which I’ll post here when I can. There are a couple of changes I’d like to make in this area the first is a discount breakdown the second is a conditional upsell feature. I think it is important for customers to know what discount they are getting (Buy 1 Get 1 Free) or why they are getting it (March Madness 20% off sale) and this is even more so if more than one discount is being applied. We’ll be retrofitting our cart pages with a more granular discount breakdown, possibly adding a subtext to cart items that associates a particular discount to particular cart items (where it can). We have a beta version of some new functionality that allows conditional upsells on the cart page – I don’t mean simply related products, more like IF customer is in Ireland AND qty of SKU WidgetB is < 2 AND cart sub total is > £50 THEN Display the ‘Buy a second WidgetB and get a third half price St Patrick’s Day’ special. We have this available to some of our stores, but I want to roll it out across them all, and then actually use it too. Not offering gift wrapping, gift messages and gift vouchers is causing us to miss out on a percentage of our sales. 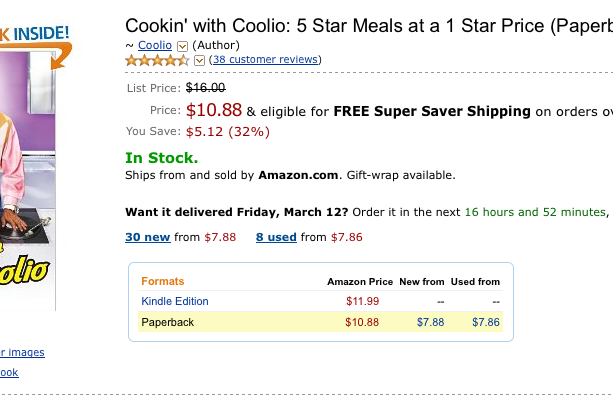 The question is how many sales, and what is the cost to us of getting those sales. This action item is two fold – first we figure out what the value of those sales is, and then decide if there is enough value in them to justify the development of a stored-value gift certificate. Part of the research into value relates to customer surveying which is discussed in the next section – we can ask our customers if they want this, and gauge their interest (and even use their feedback in the design process). It needs to be fast, and accurate. It needs to allow for spelling mistakes, it needs to offer feedback as the customer types (by way of search suggestions) and it needs to actually return useful results. It it was as easily done as it is said, then we’d have all of that, but ask Microsoft, being good at search is not easy. Spending money on search is tricky, we need to go into any new development in this area with very well defined success criteria, because you could literally develop search techniques for ever, and still not have perfect results. Picking several smaller pain points to improve upon incrementally is my preferred approach here. Wow, this turned out to be a lot longer than I thought. I’ll do the next two sections Design and Communication as separate posts in the next week so stay tuned (Update: done, part 2 is here). When they’re available I’ll link them in here for you too – hey, why not subscribe so you know when that is? I’m welcoming feedback and comments on these items, particularly from others who may have already achieved some of these goals, or are also planning to. So please, tell me what you think, what you’re planning to do, or what you have tried and how it went. Great insights from the IRWD, Ashley. Thanks for taking the time to write them up. We are also working on ways to improve the customer experience on the sites we work on. Having intuitive product pages with the least amount of “noise” is something we put a lot of importance on. By noise I mean things that explain what the user needs to do. This should be taken care of by an intuitive design as much as possible. From experience, people don’t really read most of the instructions in small type anyway. So, selecting product options needs to be as visual and intuitive as possible and feedback messages in case of error (and success) need to be obvious and context related. The problem is that this increases the cost of implementation considerably which sometimes is difficult to justify to the site owner. I think you hit on something with search as Magento’s native one is pretty crap. I have to spend a lot of time manually looking at the searches and creating redirects to the correct pages. Also I am finding that the position of the search box on the home page is very important. Their way of getting product ranked high on google, is to provide trademe feedback automatically ON the product listing page. User is doing all the work. I was hopping to make some email comms public, sothat there’s much much more content, more like facebook, just make it public, as long as you reserve the name & email addresses…gives you much more organic content and keyword hits with all search engines..
Also auto facebook’s like, or review after sales service & product experience, it would be some great sales tools and business process measurement tool… i find myself associating more slides and content with facebook, and come back later to read it…but not necessary “add to wishlist” on the e-store’s website…so there’re some very subtle user behavioural change going on here due to facebook etc..
@Nathan – thanks for sharing your thoughts. We’ve had a lot of success implementing a request for user feedback experiment through a couple of our stores. I actually wrote up a little summary of the email communication that you may be interested in too.